Big data: Who is watching your credit card use? Thirty years ago, you could, according to retired IT professor John C. McCallum, have bought an external hard drive for your computer for $1,595. Its capacity would have been 5 Megabytes (MB), which comes out at $319 per MB. By February 2013, the cost per MB for data storage devices had dropped to $0.0000467. This phenomenal fall -- together with huge advances in software applications -- has made it very cheap indeed to capture, store and analyse all sorts of information, and that, in turn, has led to the coining of one of the latest buzz phrases: big data. Everyone's talking about it, and many -- including big banks, the federal government and the debt collection industry -- are practicing it. And they're using it to spy on you. Credit card companies a new Big Brother? In February, The Wall Street Journal (registration or subscription may be required) reported that JPMorgan Chase & Co. had started to merge the 1.5 billion different pieces of information it held on its customers with federal government statistics that are already in the public domain. The bank's objective was to build a higher-definition picture of both individual consumers and groups of account holders. And the Journal went on to say that Chase was just an example: all America's largest banks are using big-data techniques to achieve similar goals. Do you always dine out? How much do you spend in high-end stores? How much in discount outlets? That sort of information -- along with whether you have kids, how many cars are in your household and your attitudes toward debt -- can be gleaned from your debit and credit card activity. But some banks have plans to monitor social media websites so they can add to their understanding of you from your posts on Facebook, Twitter and so on. It seems likely that they're also exploring the possible acquisition of personal data from those who operate loyalty programs. But it's not just big corporations that are keen to discover more about you. The U.S. News & World Report reported on April 4 that the IRS has been busy building its IT resources in readiness for the big data revolution. It's now tracking citizens' credit card statements, e-payments, online shopping and social media postings in order to catch out tax dodgers, and its computers carry out totally automated and invisible "audits" to flag up to agents those whose spending doesn't match up with their declared incomes. Meanwhile, The Boston Globe said on April 18 that federal regulator the Consumer Financial Protection Bureau is buying in from private companies, including credit bureaus, information on over 10 million Americans. However, these data are anonymous, so they can't be used to monitor individuals. Offer you the rewards credit cards, perks and deals that they know you're going to want; one day, maybe, even by customizing a package just for you. 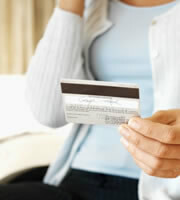 Reduce credit card fraud by instantly recognizing and challenging uncharacteristic purchases. Lend more cleverly by declining applications from those who are likely to default, something that just might (though don't hold your breath) bring down credit card rates and other charges. And, if you pay your fair share of taxes, why should you object to the IRS getting better at catching cheats? And yet there seems to be something inherently un-American about this level of intrusion into our personal privacy. And some may be unfairly disadvantaged by what is, in effect, profiling. To reduce bad lending decisions, credit card companies are, in a process marketers call "segmentation," likely to look at groups of people who have been bad payers in the past and identify non-financial characteristics and behaviors that they share. If you, a new applicant, display those same characteristics and behaviors, you could get turned down, even if you're the most honest and creditworthy person in the country. And that's the trouble with profiling of any kind. Whenever you use race, gender, religion, ethnicity or fashion choices to select people for special attention at airport security, you may increase your chances of finding a criminal, but you're also going to unfairly persecute a whole lot of totally innocent people in a process that can only be described as discrimination. The same may happen if you use profiles -- rather than credit scores, which are based on factual, historical, personal behavior -- to decide who can have which, if any, credit cards. In a country that prides itself on its freedoms and individualism, profiling -- and the spying that enables it -- may be seen by many as as steps too far. But what do you think? 0 Responses to "Big data: Who is watching your credit card use?"